"The Antikythera mechanism (/ˌæntɨkɨˈθɪərə/ ant-i-ki-theer-ə or /ˌæntɨˈkɪθərə/ ant-i-kith-ə-rə) is an ancient analog computer designed to predict astronomical positions and eclipses for calendrical and astrological purposes, as well as the Olympiads, the cycles of the ancient Olympic Games. Found housed in a 340 mm × 180 mm × 90 mm wooden box, the device is a complex clockwork mechanism composed of at least 30 meshing bronze gears. Its remains were found as 82 separate fragments, of which only seven contain any gears or significant inscriptions. . . . The artifact was recovered in 1900–1901 from the Antikythera shipwreck off the Greek island of Antikythera. Believed to have been designed and constructed by Greek scientists, the instrument has been dated either between 150 and 100 BCE, or, according to a more recent view, at 205 BCE." 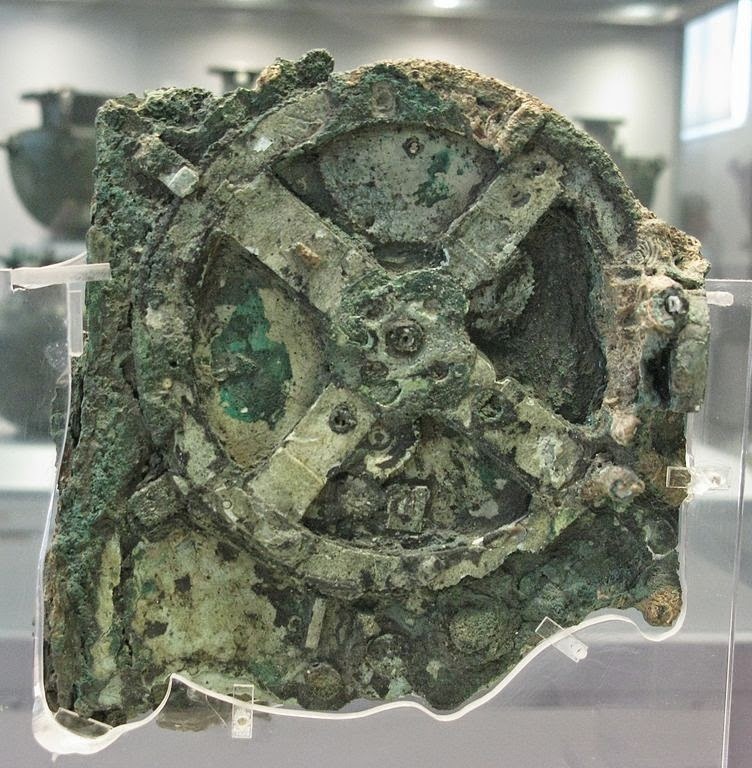 "The Antikythera Mechanism Research Project"